The Gerber Grow-Up® Plan is whole life insurance for children that provides financial protection, builds cash value and can guarantee life insurance coverage for a lifetime. The life insurance policy is affordable and is recommended by 91% of reviewers. For females in the U.S., ages 22 to 34. Gerber Life Insurance Grow-Up® Plan !! 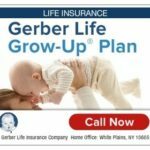 Gerber: The Grow Up Plan – Get a FREE Quote today! !